Wild things are throwing off the covers of winter and so are their garden partners! Welcome to Wildlife Wednesday, celebrating all things wild in our gardens. Here in Austin, Texas, it’s not meteorolgically spring, but it’s also definitely no longer winter. Sure, it’s likely there will more cold days, but spring is busting out everywhere and wildlife are gearing up with life-affirming activity. Birds–residents and winter visitors–have taken front stage in wildlife action for the last couple of months and they still are the leading characters of the garden. There are other garden-dwellers who are angling to slough-off their winter wears and gear-up for a new life and the promise of a mate (or mates!) and family. Bees are back! The honeybees have been around all winter, though on the coldest days, they remained well-tucked in their cozy hives to keep warm. 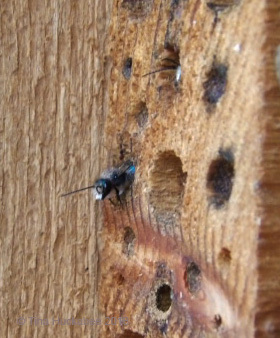 But the season is nigh for the emergence of the native bees and first in line are the Blue Orchard bees, Osmia lignaria. The highlighted link takes you to my March 2017 Wildlife Wednesday post, where I wrote about these stunning bees as they emerged at exactly the same time last year. 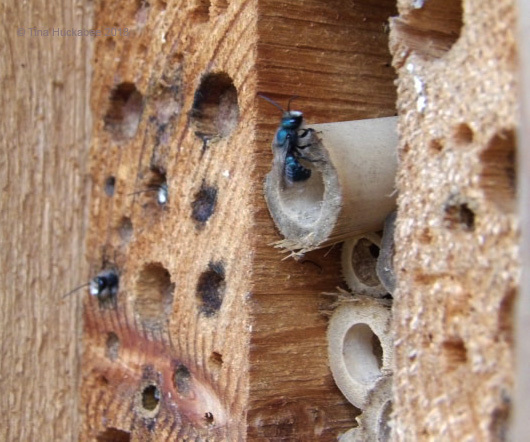 Two adult bees emerging after a year of development in the holes of an insect hotel. 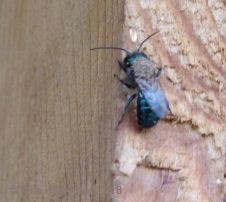 The Blue Orchid adult bees live for about a month and during that time, they mate, and then gather pollen, leaf material, and mud for their offsprings’ incubation chambers. 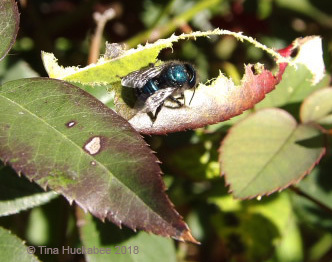 I found this Blue Orchard bee chewing away at the leaf of my Old Gay Hill rose. It’s the leaf material that they gather which gives the packed holes a green tint. This female is regurgitating her gathered material, so she’s head-first in the baby-bee incubation chamber. Check out the packed green tinged hole; is that green from my rose-leaf?? 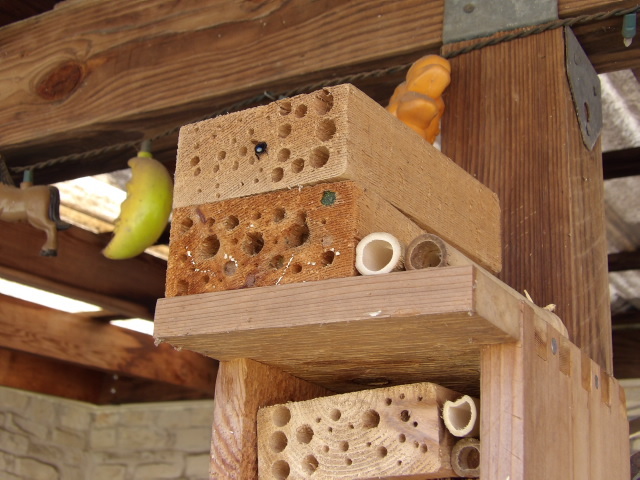 …and then pack the holes to protect the developing bees for the next year. A just-emerged adult Blue Orchard bee. You can see the holes that the adults emerge from in the packed nesting material created last February/March. It takes a full year for these blue beauties to “cook till done” but it’s time well-spent. 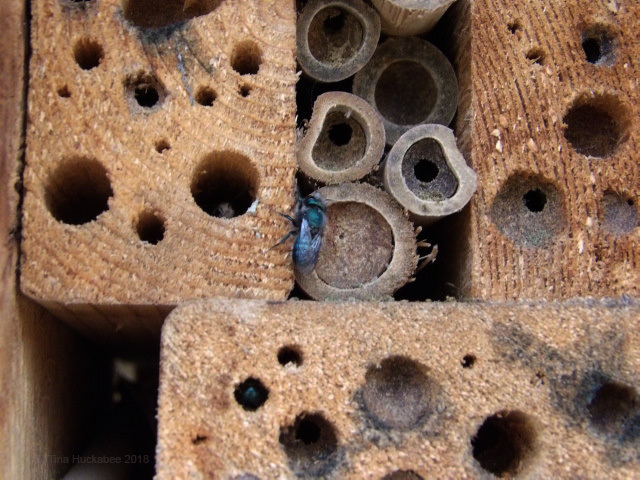 Currently, every time I walk by either of my two insect hotels, there is a flurry of shiny blue activity as the buzzers have mated and are bringing in material to secure their babies’ future. 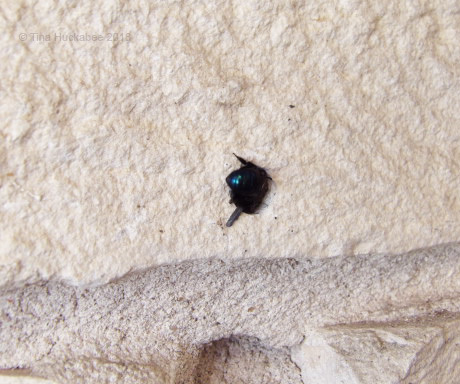 With as long a screw that I could find in our garage, I cleaned out those drilled holes where it was obvious that a bee had emerged, so that it’s available for the next generation. I couldn’t quite reach the end of the drilled holes in some nesting spaces, but cleared many spots. I also added a few more cut bamboo pieces and drilled wood blocks to the boxes. I like blue bees in the garden and will happily welcome more next year! Squirrels are ever-active and always cute. And annoying. Winter and spring are the best times to see woodpeckers in my garden and this year, they haven’t disappointed. 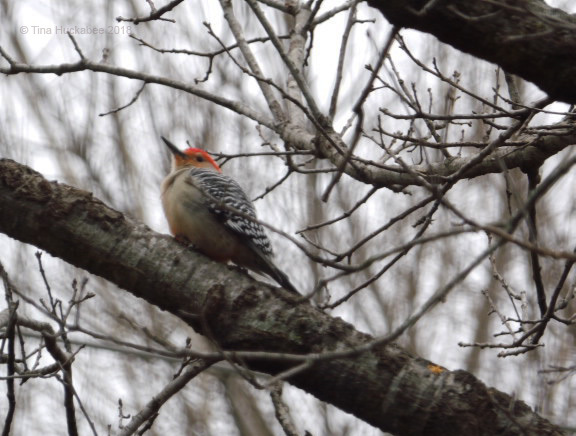 I hear and see Red-bellied Woodpeckers, Melanerpes carolinus, nearly daily. A male and female are regular visitors (mates? 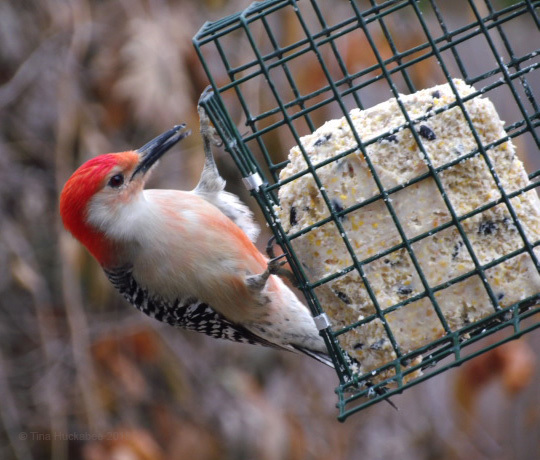 ), enjoying the commercial suet I provide in the cool seasons. This male sat for quite a time in my Red oak tree, enjoying the rest. Maybe his tummy was full. At another time, he (or a buddy) worked the bark of a neighbor’s tree. Check out the holes to his left! I don’t see the female as often, but snatched a quick shot of her one day as she nibbled at the suet. Suet is a bit gross (all that fat! ), but birds need fat during winter and so I oblige. Personally, I’d choose cheesecake. Or ice cream. Ahem. I only provide suet in winter and spring; once it’s hot, the suet spoils quickly. During the warm months, I’ve tried a recipe of non-animal fat suet (peanut butter with seeds and cornmeal), but there were no takers. A few mornings each week, I take a handful of peanuts out for the Blue Jays, Cyanocitta cristata. They love their peanut treats! Sometimes they line up along the fence line like planes on a runway, awaiting departure. Each bird waits its turn for a peanut-grab and take-off. A pretty-boy House Finch, Haemorhous mexicanus. 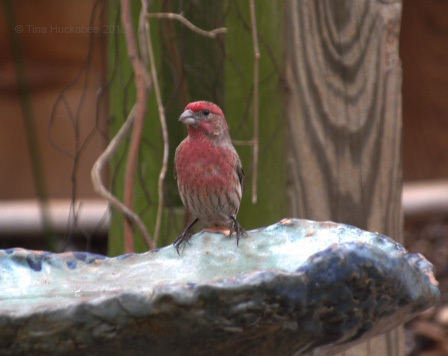 Perched at a bird bath. The males are in full-mating color form, accompanied by lots of singing! 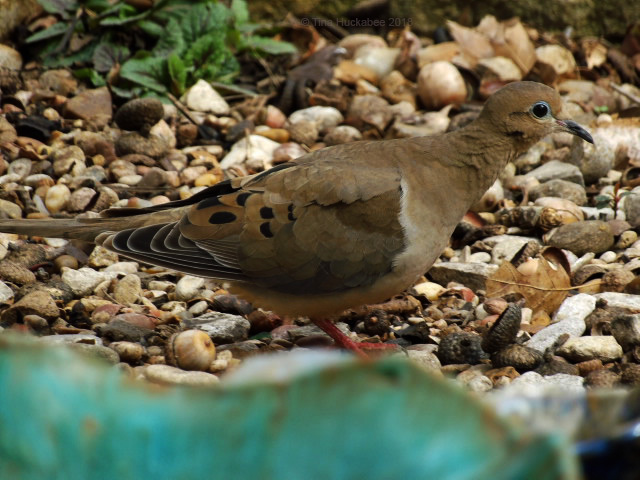 White-winged Doves are common here in Austin, but in my garden I rarely see Inca Doves or specimens of like this pretty Mourning Dove, Zenaida macroura. The bird’s blue eyeliner echos the blue of the bowl it waddled past. Its been hanging around for a week or so, nibbling seeds and resting in the sun, and walking that weird walk that doves are known for. Another common bird, replete in his stunning spring plumage, is the Great-tailed Grackle, Quiscalus mexicanus. This photo doesn’t catch the luminous colors that his feathers display when the sun shines. Instead, on this cloudy morning, the feathers showcase the velvety black that complements his striking eyes. Not my favorite bird and an invasive pest, I rather admire the plumage and coloring of the European Starling, Sturnus vulgaris. 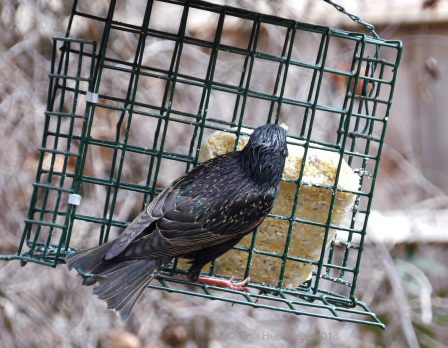 Starlings show up in late February and are bullies at the suet feeder. I usually stash away the suet when I see them congregating and chasing off the local songbirds, because a group of Starlings can finish a suet block in an hour, if allowed the opportunity. I have noticed that they only appear in the mornings, so I hang out the suet in the afternoons once they’re gone. This year, there haven’t been as many Starlings, for which I’m grateful. They are joyous bathers and make great use of my birdbaths and the bog area of the pond. The seasons are changing: winter to spring and summer to autumn. Who’s visiting your garden in this time of change? Please share your photos and stories of wild critters this past month. Remember to leave a your link when you comment. This entry was posted in Backyard Birding, Blue Orchard Bees, Eastern Fox Squirrels, European Starlings, Great-tailed Grackle, Mourning Dove, Osmia lignaria, Red-bellid Woodpecker, Uncategorized and tagged Wildlife Gardening, Wildlife Wednesday by Tina. Bookmark the permalink. The blue bees are really interesting. A year seems like a long time to wait to hatch. They are interesting–a year is a long time in the insect world. I really like placing them out. I wish I could use them in summer, but it’s just too darn hot here. Funny story about your squirrels–they are sharp little things, but you’re right: they don’t like suet. Win-win for the birds! Yeah, my step dad (who is a college prof and avid watcher of birds) once sourly remarked that he wished his grad students were as diligent as the squirrels raiding his feeders. Hahahah! Tina your photos are incredible. The Blue Orchard bee in only one month of life has to mate, lay eggs, collect pollen, foliar material and mud. Nature is amazing! 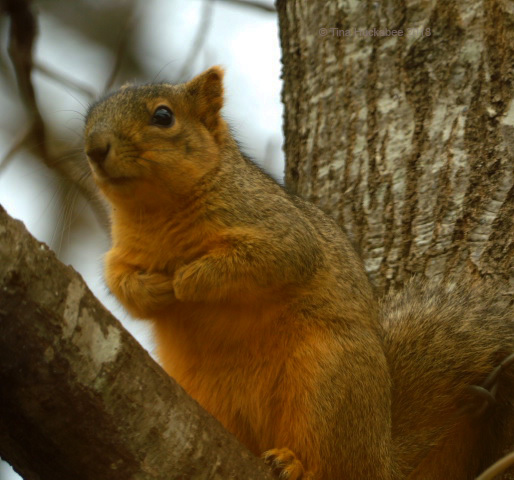 The Eastern Fox Squirrel is beautiful and mischievous. All the birds are very beautiful. I like them all. 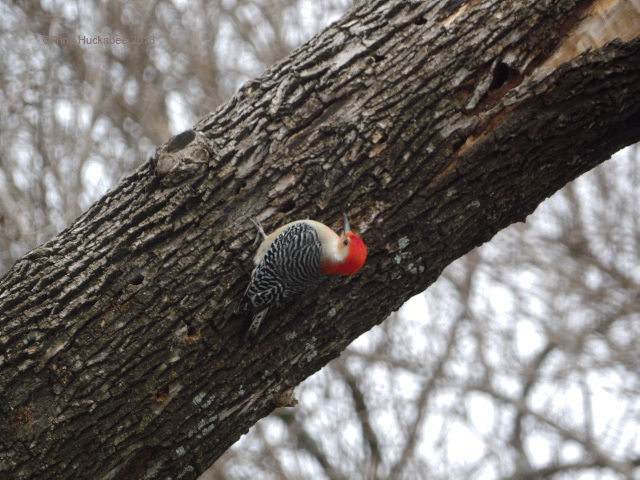 The red-bellied woodpecker makes good holes! The Azulejos have a bit of favor with peanuts. The house finch is beautiful. The mourning dove is beautiful. 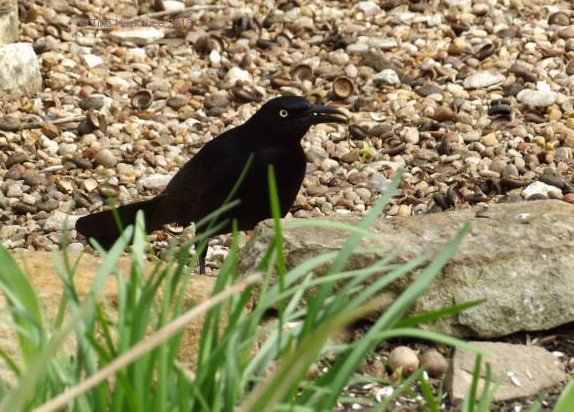 The Grackle must shine its black plumage in the sun. European starlings are a band that ends up with tallow. Go gang. But they are very beautiful. Since I am now in Madrid I listen to the Doves and I see them, the Blackbirds and their whistles and sparrows. Live Wild Life! Have a nice week. Greetings from Margarita. I hope you’re enjoying the birds in Madrid, Margarita. Cities all seem to have their share of doves, blackbirds and sparrows. Those blue bees are quite striking. Worth the wait to see all that wonderful activity. Birds are still a little slow to show up here though I hear them all around. I have managed a few sightings from the last month even with chilly, cloudy weather around. Aren’t the bees gorgeous? I’ve seen a few migratories, but mostly, it’s the winter Texans and year-rounders. European Starlings are everywhere, it seems–except in Europe! I’ve offered to ship some over, as theirs are declining, but I guess that would be tricky. I know you love the squirrel; every Australian I’ve ever met is fascinated with them. That’s fine, I’m fond of them too–cheeky little things! I’ve loved having the woodpeckers visit. Once spring is done, they’ll still be around in the neighborhood; I tend to hear, rather than see, them–but they’re around! That fox squirrel looks like a common red squirrel, but extra red. Common red squirrels were imported here a very long time ago because someone thought they were cuter than our gray squirrels. I think they are the same species. They all look the same, just different colors. Gray squirrels are not as gray as they used to be. Red squirrels are not quite as red. (Of course, they never were as red as that fox squirrel.) Both are just sort of grayisn brown. I think the red coloring was partly due to the conditions of the photo: gray, leaden day–somehow, that made the squirrel more of a rusty color. That said, he definitely isn’t a gray squirrel. I believe that the gray squirrels are only gray to camouflage better against the trunks of the oak trees here. I didn’t think the metallic blue bee I found feasting on umbrellawort (Tauschia texana) would be hard to identify, but I didn’t expect it to be so easy! I’m almost certain that it’s the same as your bees. What do you think? I’m enjoying my bluejays, just as you are. They’re the one bird I can feed without drawing in the pigeons — at least, permanently. The pigeons will shove the peanuts around for a while, but they get frustrated, and fly away. I will say that I enjoy the songs and calls of the starlings. They’re quite musical. I didn’t realize it was starlings I was hearing for quite some time, but now I know it’s them. They like to build nests in the booms of sailboats, so they’re often hanging on the rigging, twittering and calling. Little my little, our ospreys are departing. Interesting that one of my readers, who lives in Pennsylvania, just mentioned that they’d seen their first osprey of the spring. Nature’s always on the move — funny that I look forward to the first osprey in the fall. Yep, that’s the same bee–I think! 🙂 They really are the first, or some of the first, to emerge in spring. I agree with you about the starlings’ songs, quite beautiful. They are songbirds, afterall. I just wish they weren’t so numerous. They haven’t been as obnoxious this spring in my garden; there have been a few, but not the 15-20 that sometimes appear. I love it when a reader, or someone I’m following reports that the monarchs or migratory birds have arrived in the northern spots where they spend their breeding seasons. It’s a salient reminder of our interconnectedness. Great post. 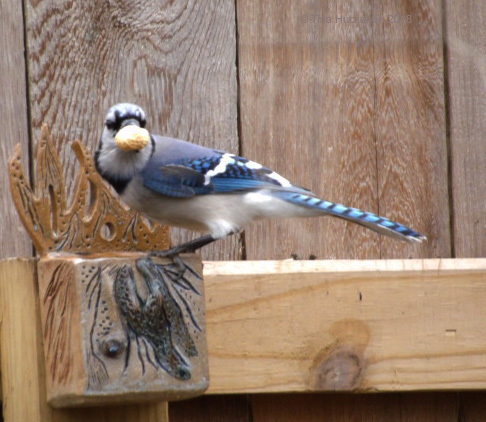 Your blue bees are fascinating and I love the idea of the bluejays lining up for peanuts. Ah, starlings, it has been so long since I saw one that I am currently feeling benevolent towards them, but I absolutely remember the annoyance of their mobs and greed. Glad you can get round most problems by feeding in the afternoon. I wish we could send you starlings–we have plenty and you are lacking. It’s worked well and truthfully, they haven’t been as much of a problem this year. Thanks! I generally enjoy the squirrels. The only time I really am annoyed is when they dig in my container plants. Grrrr! If I wanted an oak tree in that pot, I would have planted one! We have 3 acres that we manage for pollinators, but I have yet to see a bee in any of the little boxes or bamboo sticks we made for them. 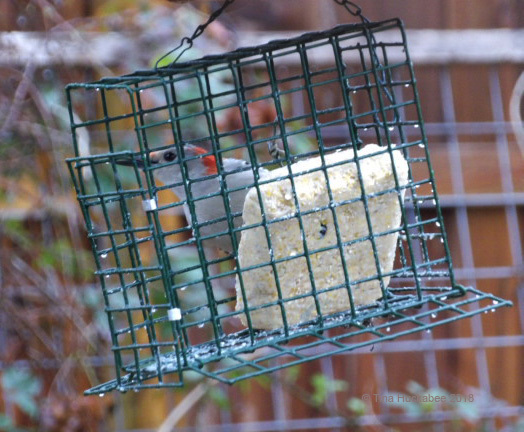 But I see them around, so I know they are here… I gave up on suet here – I am convinced my birds are just suet-dumb and will never get it, so I gave up. Wow, three acres! Impressive! When we first put our boxes up, only one was used. It seemed to take a while for the other one to catch on as a good home for baby bees. Now, both are used and the Blue Orchard bees are using the second one for the first year. Are your boxes in protected areas? 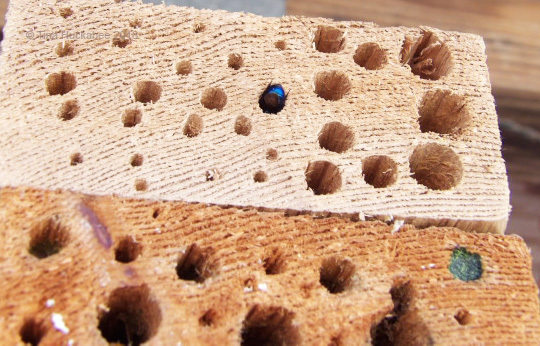 That seems to make some difference in whethter the various native bees will take a liking to the box. Thank you. Bees come in all sizes and many lovely colors. Glad you enjoyed the post and thanks for reading.